Robert Fulghum engages with musings on life, death, love, pain, joy, sorrow, and the best chicken-fried steak in the continental United States. The little seed in the Styrofoam cup offers a reminder about our own mortality and the delicate nature of life . . . a spider who catches (and loses) a full-grown woman in its web one fine morning teaches us about surviving catastr Robert Fulghum engages with musings on life, death, love, pain, joy, sorrow, and the best chicken-fried steak in the continental United States. The little seed in the Styrofoam cup offers a reminder about our own mortality and the delicate nature of life . . . a spider who catches (and loses) a full-grown woman in its web one fine morning teaches us about surviving catastrophe . . . the love story of Jean-Francois Pilatre and his hot-air balloon reminds us to be brave and unafraid to “fly” . . . life lessons hidden in the laundry pile . . . magical qualities found in a box of crayons . . . hide-and-seek vs. sardines—and how these games relate to the nature of God. 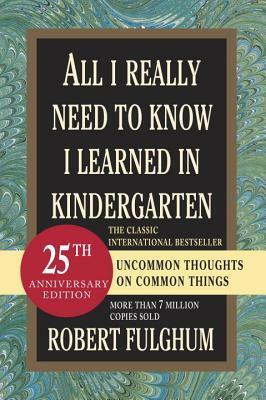 All I Really Need to Know I Learned in Kindergarten is brimming with the very stuff of life and the significance found in the smallest details.